• Family fun day, Tanger Outlets Columbus, 400 S. Wilson Road., Sunbury, 11 a.m. to 7 p.m. Saturday. The mall will celebrate its one-year anniversary with arts and crafts for children, food trucks and music in the center courtyard. For more information go to www.tangeroutlet.com/columbus. • Summer Solstice Festival concert, Austin Manor, 95 Elizabeth St., Delaware, 4 p.m. Saturday. In partnership with the Northwest Neighborhood Association and the Central Ohio Symphony, the Cole Duo and the symphony will perform on the south lawn of Austin Manor. The concert is free and open to the public, who are encouraged to bring blankets and chairs and a picnic. Food trucks, art sale and activities will be on-site. More information can be found at www.centralohiosymphony.org. • 4th annual MingoMan Triathlon/Duathlon, Delaware State Park, 5202 U.S. 23 N., Delaware, 7:30 a.m. Sunday. Presented by Mount Carmel, the triathlon will include a swim in the reservoir of Delaware State Park, a bike race and finally a run through the streets of Delaware. For more information go to www.mingomantri.com. Transformers: The Last Knight (PG-13): 2 p.m., 5 p.m., 8 p.m.
Wonder Woman (PG-13): 2:15 p.m., 5:15 p.m., 8:15 p.m.
Cars 3 (G): 2:30 p.m., 5:30 p.m., 8:30 p.m.
Transformers: The Last Knight (PG-13): 1 p.m., 4 p.m., 7 p.m.
Wonder Woman (PG-13): 1:15 p.m., 4:15 p.m., 7:15 p.m.
Cars 3 (G): 1:30 p.m., 4:30 p.m., 7:30 p.m. Some of Delaware County’s most beautiful gardens will be on display Sunday when the Women’s City Club of Delaware hosts its annual tour. The self-guided tour will feature eight different gardens throughout Delaware County with experts from The Ohio State University Extension Master Gardener Volunteer Program available to answer questions about techniques and tips. “We change it up each year,” said Jo Ingles, publicity chairwoman of the WCC. Proceeds from the event’s ticket sales will benefit the WCC. The more 60-year-old nonprofit has provided transitional low-cost housing to women in Delaware. It now has an ongoing capital campaign for new windows, but the tour funds will not be earmarked for only that project. The WCC has conducted the tours for at least 15 years, she said. But this year the tours will not be confined to Delaware’s Northwest Neighborhood. Six of the tours will be home gardens, said Robin Amstutz, the chairwoman of the tours. This is Amstutz’ first year coordinating the event, but she has been a WCC volunteer for the last two years. “This is something I would enjoy,” she said. 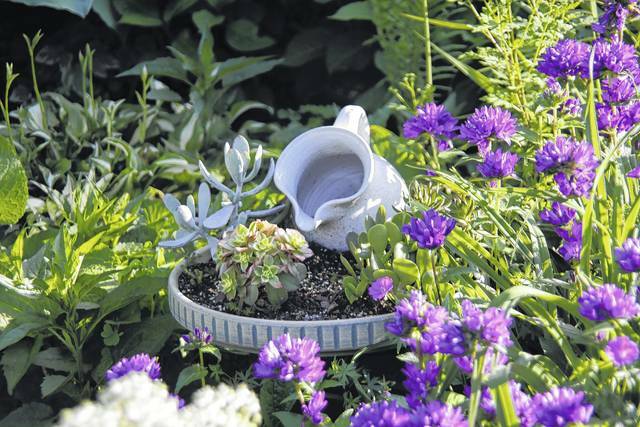 Diana Daily has a notable garden on the tour at her 200-year-old farmhouse in Sunbury. She started the garden many years ago with perennials around an old church bell. She incorporated discarded farm tools and created fountains from old salvaged treasures. There are also several miniature gardens on hee property. Daily’s garden was featured in an issue of Ohio Magazine this year. The Master Gardeners will provide an expert for about half of the sites including Daily’s garden, said Cindy Kaelber, the program’s coordinator. Master Gardener volunteers have participated in the tours for three of the last five years, she said. The garden at the OSU Delaware County Extension office, 149 N. Sandusky St., will be part of the tour with Master Gardener volunteer Shirley Gibson. That garden was designed and planted in 2011 and has been maintained by members of the Master Gardener Volunteer Program. The program has more than 100 members in Delaware County and provides training in horticulture for interested Ohio residents. Volunteers devote time to assist with educational programs and activities for other residents through the local OSU Extension county office. The tour will run from 1 to 4 p.m. and start at the WCC, 135 N. Franklin St., in the city. For more information, visit www.wccdelaware.org.